Traditionally, fish crackling is an Asian snack where fish are de-scaled, fried and and sprinkled with various spices to make a crunchy and delicious on-the-go snack. 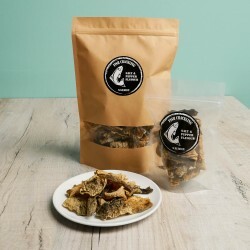 Little Kitchen NI's fish crackling is made using salmon skin for an exciting snack which is not only tasty, extremely crispy and well-seasoned, but is also high in protein and Omega 3 too. Their crackling is made from locally sourced Scottish farm salmon, which is carefully individually fried and hand-packaged to ensure the very best quality.